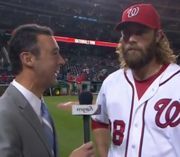 After watching Stephen Strasburg’s two latest efforts, I am going to say something that Mike Rizzo is possibly thinking about reluctantly: the time has come to bite the bullet and trade Strass. I have watched nearly every game he has pitched for the Nats, starting in 2010. He is not a pitcher who can be sent into “must-win” games or even your everyday “important” ones that are routine for a pennant-contender. His mental “makeup” does not handle stressful situations, pressure or adversity well at all. Unfortunately, that is simply not going to change much. If the team is serious about wanting to reach the playoffs, they need to get engaged with going after David Price, Jeff Samardzija or Cliff Lee before the trade deadline. For those who got to watch the 3-game playoff, won by Vanderbilt U., it was quite a treat! Except for the truly freaky 9-run inning in the first game, both U.Va. and Vandy were very well matched; good hitting, good pitching, and good TV announcing. I could see these were two very well coached teams. Though I can’t remember how many of the players had been amomg the recent pro draftees, I know it was many of them. And I could see how both David Price and Sonny Gray (and other pro pitchers who’se names I can’t remember) had received a good foundation at Vanderbilt. Nats in good spot right now. The tea leaves are looking very good for the Nats at this point. 1. They took 2 of 4 from the Braves, though they should have won the 15-inning one. 2. Gio (having a mediocre year thus far) pitched very well last night, showing he actually does have some mental toughness, holding one of the best hitting teams in baseball scoreless! 3. Harper and Ramos will be back soon and are playing well in rehab with the P-Nats. 4. Adam Laroche, the best hitter on the team so far, is having a great year with the bat. He is right up there with the league leaders. For me the BIG question mark is Ryan Zimmerman. He is not hitting as he usually does, and with Harper coming back, wherever you put him on defense he will be the least effective player on the field. If it were up to me I would try to trade him, knowing that will be difficult with the contract he has (and mediocre performance). But baseball is a business, right? We’ll see what Mike Rizzo is made of. Lesson One: As the Nats relief pitcher Blevins walked off the mound after the top of the 12th inning (having shut down the Braves offense), I was getting excited because the Nats had their 3,4,5 hitters coming up to face a rookie (Ryan Buchter) who had never pitched in the bigs! And to top that off he was a lefty!! The Nats hitters tend to feast off southpaws:) What happened? Well, the “face of the Nationals” hit into a double play to force a tired Blevins into having to pitch a second inning. We now know what happened next. So this is my bottom line assessment of that sad 13-inning game. The Nats almost set a new team record for stolen bases last night. They snagged five (in the first three innings!) to tie the record, but that would be the end team larceny in the game. However, the 5th steal was by far the BEST! As Jason Werth began his slide, he saw that Jose Altuve (Houston’s All-Star second-baseman) already had the ball and was getting set to tag him out. So he altered his slide, knowing that Altuve would swipe his glove across the front side of the base, so that he would stop about 5-6 inches short of the base. As he did that he popped up to his feet after Altuve’s glove had attempted the tag, and quickly got one foot on top of the base! All Altuve could do was stand there dumb-founded:) I have seen the play live in a video clip, but have not been able to find it in Slo-Mo. In the live clip everything happens too fast to see what actually happened. But I was listening to the game on 106.7 and Charlie Slowes explained what he had seen replayed on Slo-Mo where he was sitting. Which Gio will Show Up Tonight? Note: The U.Va. team prevailed last night at the College World Series, but it took them 15 innings to do so! Not sure yet who they face next. The Nats just lost three straight in St. Louis, so this seems like a good time for something to laugh about! Here are 51 classic baseball gems. Enjoy. 26. Alan Sutton Sothoron pitched his initials off today. – Anonymous, St.
51. I couldn’t a done it without my players. Casey Stengel on winning the pennant in 1949. The low point (Death Valley) in yesterday’s finale in SF came in the 5th inning, when the Nats had runners on the corners with pitcher Blake Treinen coming to bat with NO OUTS. The smart move there is to have him lay down a bunt to get the runner from first to second. Then they have the top of the order coming up with 2 runners in scoring position. Great! But then we find out Treinen failed “bunting 101” in Spring Training! Incredible. How could a detail-focused manager like Matt Williams let that small fact slip by him? I was a pitcher through college and I still remember the drills in “Pony League” (now called “Babe Ruth” league) when I was 13. The coach (it could have been Bud Younger, who once pitched at the AAA level) pitched to our group of young hurlers as we practiced bunting until we likely went home with blisters on both hands. To this day I rarely fail to get a bunt down when the situation calls for it. Anyhow, I watched in disbelief as Treinen had THREE CHANCES at bunting and missed them all! The next batter then hit a groundball that would have scored one run for sure and tied the game, keeping the inning going. But since the bunt attempt failed, the ground ball instead resulted in an inning-ending double play. The “little things” will derail many a good team.